CHECKERS — game units with which moves are made. Each player has 15 checkers. POINTS — special places for checkers with the form triangles. Paragraphs are numbered from 1 to 24. START — the starting position of the player at the beginning of the game of checkers. HOUSE — the last quarter of the playing field (from 19 to 24 points ) . MOVE — movement chips according to the fallen to dice points. In one move, the player can make from 1 to 4 movements checkers or miss the move. 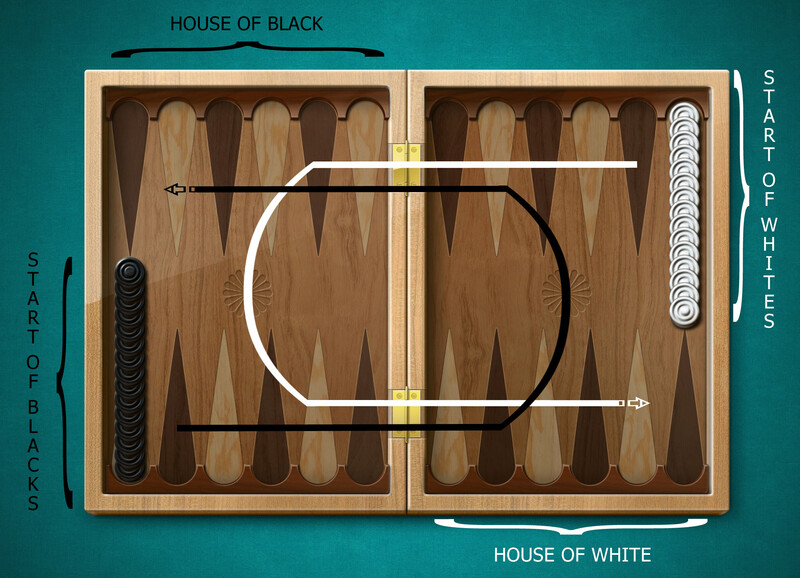 Backgammon is held between the two rivals, each of which has 15 checkers on one point on the left side of the board ( "start" ) . Moving the checkers is counterclockwise. The aim of the game is to pass all the checkers full circle and throwing them before the opponent. .
Each player rolls one dice. Whoever drops more points will go first. Before the loss of the double throw its repeated. If, after one party they start the second game, the winner will go first. 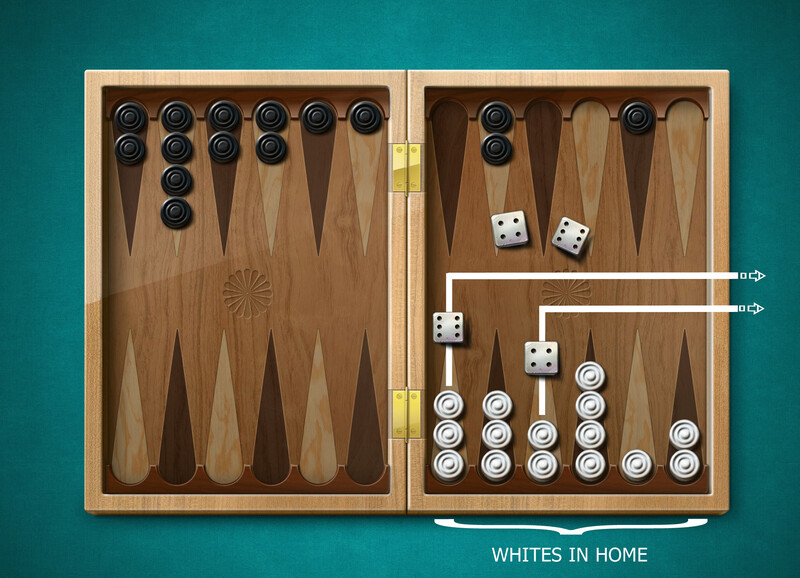 In backgammon player rolls two dice. After throwing one man moves to the number of points corresponding to the points on the same cube, and the second cube (or the same one) - The number of points corresponding to the points on the second cube. 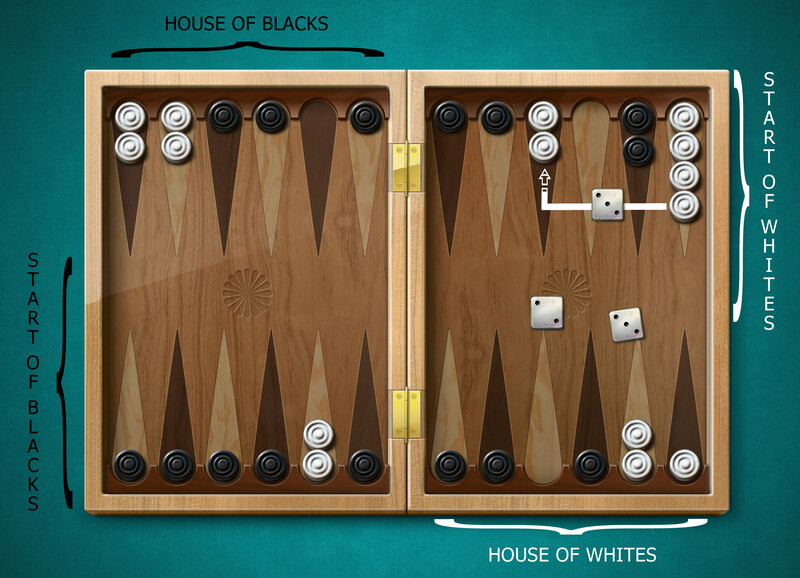 It does not matter according to which dice player moves the checkers. Pict.2. DROPPED «TWO» & «SIX». Stay in one checker with the "Start" and move it to 2 points and another checker move by 6 points. Move one of the checkers by 8 points. When starting player can take only one checker. The exception is in the beginning of the game (for example, combinations of dice six - six, four - four, three - three), when checker hits the opponent occupied points. In this case, go with two checkers. If both dice fell the same number of points (double), the player is able to do not two, but four stroke on the number of points corresponding to the points on one of the dice. If the player can not move his checkers on the number of points corresponding to points on the cubes dropped (checkers fall into occupied rival points) , he loses his turn . Conversely, if the move is possible, the player is obliged to do, even if this move is disadvantageous to him. If points fell on one of the dice that cannot be used, they are lost. In this case, the player makes a move with only one checker. If both are available to move (according to points at dawn one or two dice), the player must make a move using two charge points (Pict. 3). If you can move only one of the two pieces (i.e. move one excludes the possibility of checkers another stroke), the player must make a move according to the dawn with the most points ((Pict. 4)). Pict. 4. Dropped "two" and "three". You can move only one checker, or two, or three points. Under the rules of whichever is greater credit checker moves on three points. «To throwing out the checkers » - means to make moves, after which checker is outside the board. You can only throw checkers when all player's checkers are in the house . 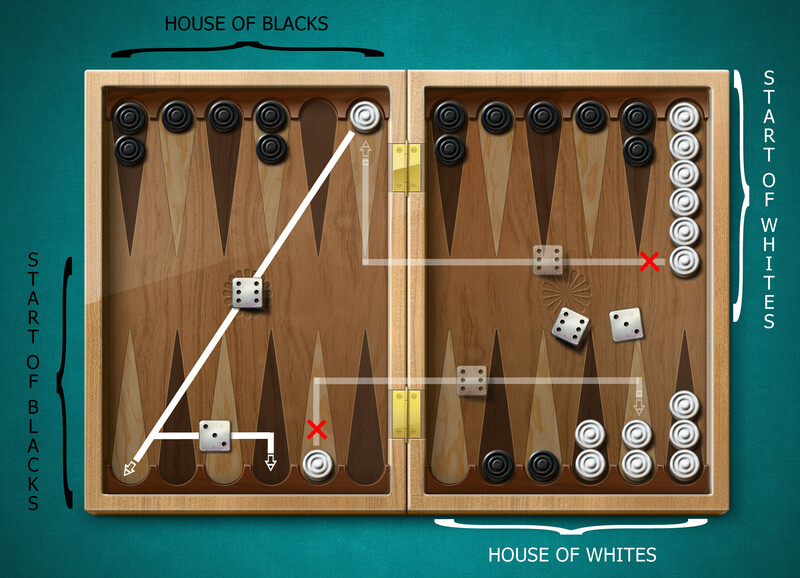 Checkers can be disposed of only with the items corresponding to points fallen on the dice. (Pict. 5) . Player is allowed to take out checkers with lower rank fields if the fields of higher checkers are not available . Pict.5. All white checkers came to the house. Now the player can "throw-away " them. Dropped "four" and "six". Throw a checker in the fourth row, and one checker from the sixth row. 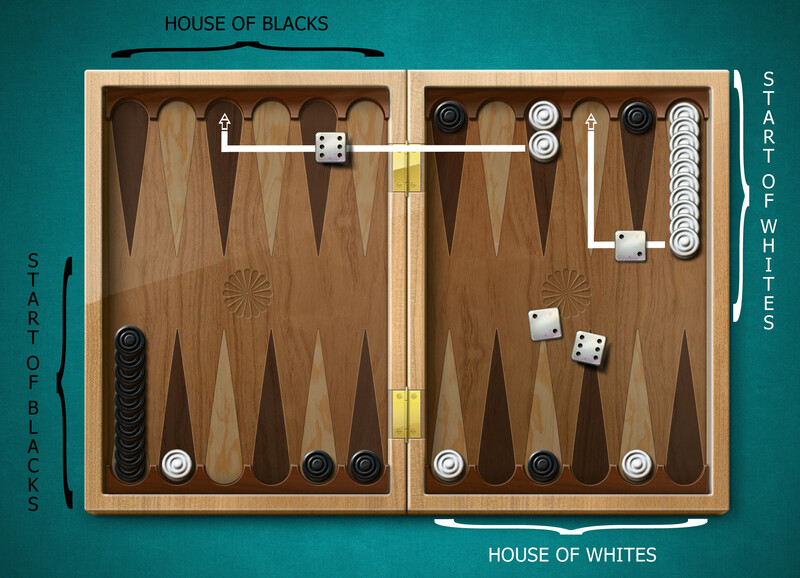 Backgammon does not have draw . If one player threw all his checkers first, the second is a lose, even if the next roll , too, can throw all their pieces . Checkers position late in the game in which the loser had to withdraw at least one of his checker. 1 POINT.